Porosity is the percentage of void space in a rock. Porosity is the percentage of void space in a rock. It is defined as the ratio of the volume of the voids or pore space divided by the total volume. It is written as either a decimal fraction between 0 and 1 or as a percentage. 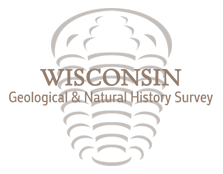 For most rocks, porosity varies from less than 1% to 40%. The porosity of a rock depends on many factors, including the rock type and how the grains of a rock are arranged. 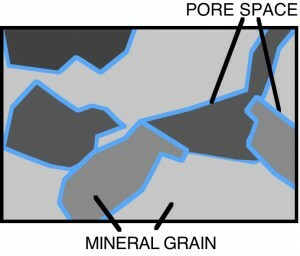 For example, crystalline rock such as granite has a very low porosity (<1%) since the only pore spaces are the tiny, long, thin cracks between the individual mineral grains. 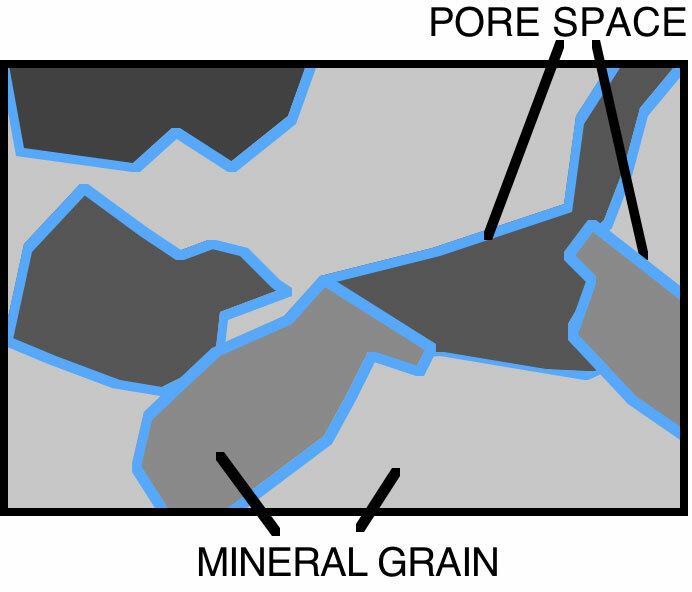 Sandstones, typically, have much higher porosities (10–35%) because the individual sand or mineral grains don’t fit together closely, allowing larger pore spaces. The porosities of the rocks measured vary from 2% to more than 30%. Much of this variation is due to lithology (rock type). 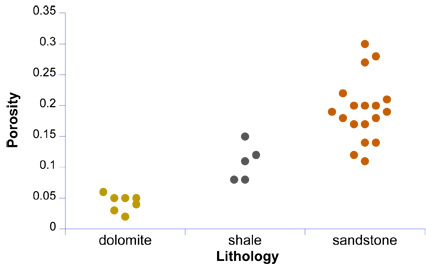 The data table lists the porosities of the tested samples and the figure at right shows the range and distribution of porosities by lithology. The dolomites have the lowest porosities (2–6%), the shales have the widest range of porosities (8–29%, although most are less than 15%), and the sandstones have the highest porosity (11–32%). Figure 1. Distribution of porosities for dolomite, shale, and sandstone. • the fluid filling the pores. Density is defined as the mass per volume. 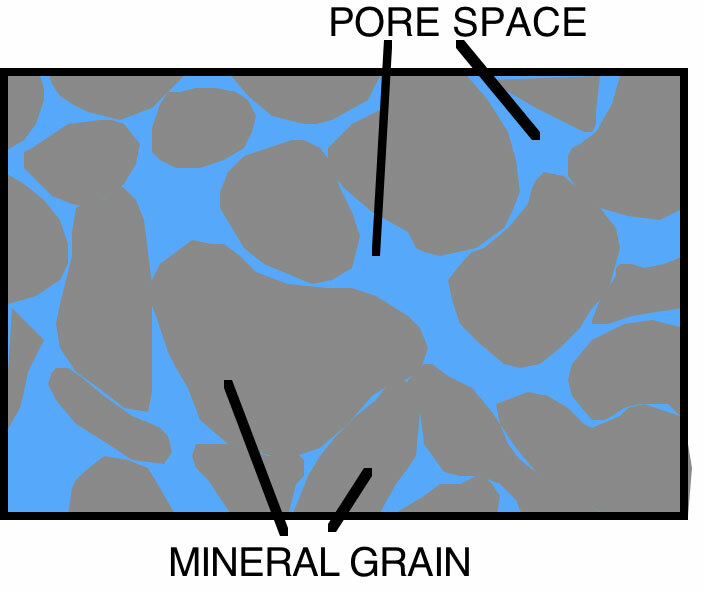 In rocks, it is a function of the densities of the individual grains, the porosity, and the fluid filling the pores. There are three types of density in rocks: dry density, wet density, and grain density. The data table lists the dry, wet, and grain densities of the samples. Additional wet densities for Wisconsin rocks can be found in “Density and Magnetic Susceptibility of Wisconsin Rock,” by S.I. Dutch, R.C. Boyle, S.K. Jones-Hoffbeck, and S.M. Vandenbush (Geoscience Wisconsin, Vol. 15, p. 53–70). Figure 2. 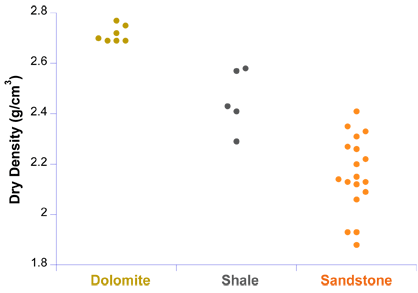 Distribution of dry density for dolomite, shale, and sandstone. Dry density is measured on rocks without any water or fluid in their pores. 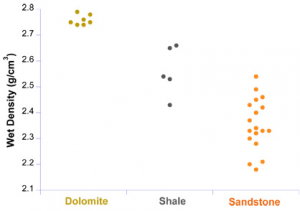 See the figure for dry density distribution of dolomite, shale, and sandstone. Figure 3. 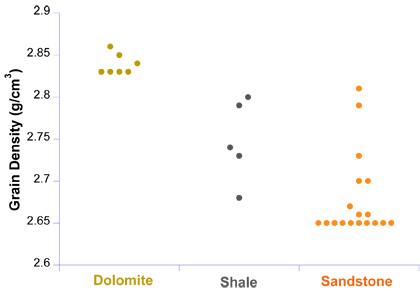 Distribution of wet density for dolomite, shale, and sandstone. Wet density is measured on fully saturated cores. 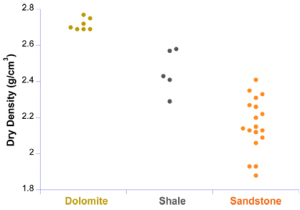 The figure shows wet density distribution for dolomite, shale, and sandstone. Figure 4. 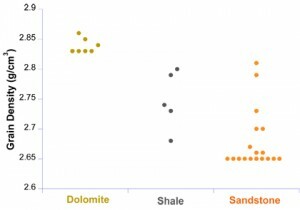 Distribution of grain density for dolomite, shale, and sandstone. Grain density describes the density of solid or mineral grains of the rock. Shales are composed of several minerals that have different densities in different relative amounts. The minerals may include clays such as illite (ρ = 2.6–2.9 g/cm3) and kaolinite (ρ = 2.6 g/cm3) mixed, for example, with dolomite (ρ = 2.8–3.1 g/cm3) and calcite (ρ = 2.71 g/cm3). Nearly half of the sandstones have grain densities close to 2.65 g/cm3, the density of quartz, suggesting that those sandstones are composed of quartz grains and cement. The remaining sandstones have slightly larger grain densities, most likely due to mixing of quartz with more dense minerals like calcite (ρ = 2.71 g/cm3) or dolomite (ρ = 2.8–3.1 g/cm3). 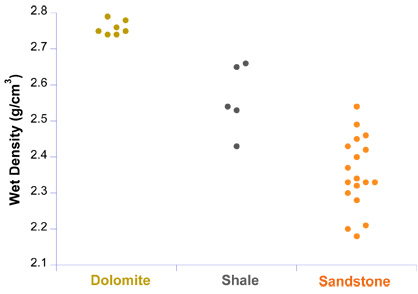 See figure 4 for grain density distribution of dolomite, shale, and sandstone. The porosities were determined by measurements of the total volume and pore space volume of the samples. We prepared right cylindrical cores using a core drill press, a rock saw, and a surface grinder. Measuring sample volume: Calculated by measuring the length and diameter of the cylinders using a calipers. Most samples were a nominal 2-inch diameter and 1 to 3 inches long. Drying the samples: Samples were oven-dried at 70°C (158°F) for at least 24 hours before testing. Measuring pore space volume: Pore space volume was determined using a helium pycnometer. The helium pycnometer makes use of Boyle’s Law (P1V1=P2V2) and helium gas, which quickly penetrates small pores and is nonreactive, to determine the solid portion of a sample. The core is placed in a sample chamber of known volume. A reference chamber, also of known volume, is pressurized. The two chambers are then connected, allowing the helium gas to flow from the reference chamber to the sample chamber. The ratio of the initial and final pressures is used to determine the volume of the sample solid. The pore volume is the difference between the total volume and the solid volume as determined by the helium pycnometer. This technique can only be used to measure pores that are interconnected. Helium and water do not penetrate into isolated pores, so these pores are not included in the porosity measurement. Dry densities were determined by weighing the samples after drying and dividing the mass by the total sample volume. Wet densities were then calculated by assuming the porosity of the sample was filled with water, adding that mass to the dry measured mass and dividing the sum by the total sample volume. 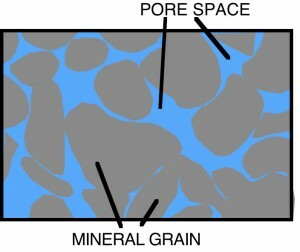 Grain density was calculated by subtracting the pore space volume from the total sample volume and then dividing the difference by the dry mass.